Anxiety and stress are highly prevalent nowadays. Many people work far more than 40 hours a week, have more than one job, have to deal with balancing work and school, need to attend to the needs of their families, in addition to a variety of other things they need to complete during the day. Money problems, stressful home environments, lack of work/life balance, and so many other things can stress people out or contribute to their anxiety. Chronic anxiety, of course, should be treated by a professional but if you are someone who experiences occasional rises in stress-levels or wants something to go along with treatment for anxiety, guided meditation for anxiety and stress relief may be a good thing to consider. When you think of meditation, what kind of image comes to mind? Many people think it is just laying there, breathing deeply, and maybe you thought of “clearing your mind”. It is more than that, however. Guided meditation is designed to relax your body and guide you on a “journey” to assist you in reaching a goal. If you’re someone who has problems with public speaking, you can use guided meditation to put yourself in a calm state and then practice a public speaking scenario in your mind. You will activate muscles in your body you may use during the public speaking experience, muscles in your face or your arms, for example. You can expand your diaphragm in line with a natural speaking rhythm. By imagining this scenario while you are in a stress-free, relaxed state of mind, you can start to think of public speaking as being a more relaxing thing over time. How does this work? When you experience something, your brain stores the experience in your brain as a memory, not just of the actual events but of the emotions you felt, the state of mind you were in, the sensations involved, etc. Many good experiences with something, such as learning a new language or having a good history when it comes to choosing romantic partners, will make your brain think of certain experiences as positive overall. When you have similar experiences again, they won’t invoke negative thoughts or reactions because you think of them as good, as safe. On the other hand, when you have bad experiences with something, your brain begins to think of these experience as negative. This can trigger the “fight or flight” response when you have the same experience again, making you anxious or stressed out. By going through a guided meditation and working toward making your brain associate more positive emotions with public speaking, driving, going on a date, etc., you can ease those feelings of stress when you have the actual experience again. There are a variety of one-off videos online that guide you through a meditation session. You can also find guided meditations at many places such as yoga studios if you’d like to do one in person with a professional. For those of us who want to relieve stress from the comfort of our own home and get a little deeper than just watching a video, there are courses online at MindValley University. MindValley University has a very worldly team of people behind it. Their entire team comes from over 46 countries and they have a variety of different backgrounds and skillsets. They are artists, filmmakers, cultural experts, public speakers, philosophers, spiritualists, life coaches, financial advisors, and much more. The people who work for MindValley University believe in sharing their knowledge so that everyone can be exposed to different ideas and grow as people. Aside from their online classes, they also have events all around the world and are a publishing company as well so you can experience learning from them in a number of ways. Lifelong learning is important and this is one of the reasons MindValley University was founded. They want everyone to grow in mind, body, and spirit. Everyone, from the founders to the teachers to the behind-the-scenes coders are dedicated to providing meaningful knowledge and skills beyond what you can learn in a traditional classroom. Learning should be fun and it shouldn’t stop once you graduate from high school or college. Read any of their reviews on the website and you will see plenty of happy students. One of the great things about MindValley is that they don’t just post selected positive reviews. Anyone who has taken a class can write a review and it will be published. They also try to respond to any critical or negative reviews and work toward turning an unsatisfied student into a satisfied one. MindValley University has a variety of programs and free courses in their Mind and Spirit section. Choosing one involving meditation or hypnotherapy is a good way to find not only guided meditations but other resources to build your skills in lowering your stress levels and fighting off anxiety. Have you tried meditation before but just can’t seem to get anything out of it? Maybe you weren’t able to relax. Maybe you relaxed a bit too much and fell asleep. Maybe the experience just seemed boring and useless. 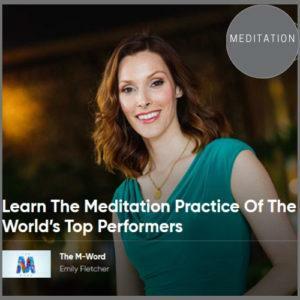 Try “Learn the Meditation Practice of the World’s Top Performers.” This is a whole new approach to meditation. Each meditation only takes a few minutes. You don’t have to spend a lot of time clearing your mind or focusing on your breathing, as you do with some other meditation courses. The meditations in this course are also designed to be fun and fulfilling so you won’t feel like you’ve wasted your time after completing them. This course is designed to support you on your journey to living a happier, more successful life. Each course is only 10-20 minutes so that you can fit it into even the busiest of schedules. By the end of the course, you’ll have the skills you need to become a top performer yourself and move on up in the world, without the added stress. 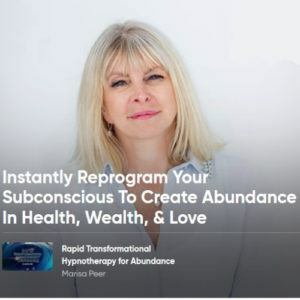 “Hypnotherapy for Abundance” is a good choice for anyone who feels like something is holding them back from achieving their health, career, or romance goals. According to this course, your brain is programmed by a variety of factors to settle you into a sort of comfort zone and to react, with stress and anxiety, when you are pushed outside of that comfort zone. This can keep you from fully realizing your dreams, experiencing a fulfilling romantic relationship, pursuing your true passion, or truly feeling healthy in body and mind. This course has a series of 20-40 minute guided sessions to reprogram your brain and help to push you past that comfort zone and into a life where you are really thriving, not just surviving. You will learn to let go of whatever is holding you back. The first session is designed to help you start to get rid of negative thoughts and emotions, including any self-sabotaging thinking that prevents you from pursuing the things you want. You’ll learn how to go back to that sense of wonder you felt as a child, that feeling that you can do or be anything. Over the course, you’ll build your self-confidence, learn how to beat unhealthy cravings or kick addictions to the curb, cut through all those mental blocks holding you back, and gain the skills you need to heal conflict with your loved ones. Want to learn how to practice meditation for yourself to help reduce stress levels even when you can’t do a guided meditation? 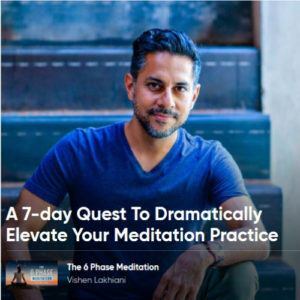 Take the “6-Phase Meditation Quest.” This is a short course, only seven days, and by the end of it, you will have all the skills you need to start doing daily meditation on your own. The course is designed to help you transform yourself in as little time as possible. It comes with both warm-up exercises and guided meditations for each part of the six phases of the meditation quest, plus one extra to use after you’ve finished the course. You will learn how to be a happier, healthier, more compassionate person by the end of the course, even while you’re still living your regular, stressful life. The best part is that you can continue transforming yourself after the seven-day course is over, as it sets you up for success and for continuing your meditation practice on your own, without the assistance of the course. Meditation can seem confusing or even useless to some people, but the reality is that it is more than the stereotypes associated with it. You can use meditation as a way to unwind after a busy day. You can also use it to reprogram yourself away from negativity and toward a positive outlook on life, which really helps to reduce stress and allows you to pursue your dreams more fully. If you are somebody who struggles with stress or anxiety, go ahead and try a guided meditation for anxiety and stress relief course today. I am happy to learn about the offerings of Mind Valley University.I was not aware of this organization and I see that they offer free starting courses.I may try one.However, your article seems to equate guided meditation with Hypnotherapy.To me meditation is a practice to achieve calm and clarity of thoughts, and it has undisputed value.However, Hypnotherapy involves re-programming yourself .There is a danger in trying to re-program yourself since how do you know what your goal should be. You may re-program yourself to a wrong goal. Maybe one of your courses will clarify this issue. Hi Carlos. Of course, re-programming your mind without clear goals can be harmful. However, this is not what hypnotherapy aims at. It tries to eliminate the obstacles on the way to your goals that you cannot eliminate yourself, especially obstacles that are rooted in self-doubt. Such obstacles are associated sometimes with intense emotions. This is the reason why without specialized aid, your efforts can remain fruitless. On the other hand, one of the main benefits of meditation is reducing the intensity of such emotions and allowing thus the individual to move more easily towards his goals, which give him more self-trust and inner balance, eliminating, therefore, anxiety and stress. I have my always had my fair share of stress episodes, but lately the stress levels are really increasing due to some financial problems I have been facing. Guided meditation is something I want to try to see if I will be able to calm myself. I will check out the courses online at Mindvalley University as recommended by you; I’d like to get through this at home. It’s good that the courses do not take long and that they will guide me to become a top performer, I need that to be able to succeed in my online business to at least make some more money and sort out my money issues.I can’t wait to check the courses out, many thanks. Hi Victor. You are welcome and I wish you luck in all your efforts! Hi. Yes, please do it, I am sure she will find great benefits in these techniques. The title of this article grabbed me immediately. I’ve been a huge advocate for mediation, in general, the past few years of my life. I’m a person who experiences a lot of anxiety and stress sometimes but what usually keeps me even keel is actually meditating or practicing presence daily. Although when I first started I used guided meditations on the Insight Timer app as you explained here with Mind Valley, I transitioned into doing transcendental or mindfulness meditations myself. I started listening to Eckhart Tolle while practicing body scanning and surrounding awareness. He explains how and why to be present in everyday life which has cut down a lot of anxiety and negative thinking/emotions for me. Hi Francesco. I am glad that meditation helped you so much. It helped me also. Hi Seun. Many times meditation seems not to function. But if there is someone to guide you, you can overcome this frustration. On this website, you certainly could find such a trainer. Hello, I really like your message. I agree that the untrained mind is on autopilot most of the time. I think it was Aristotle who said, “the unexamined life is not worth living.” I have tried meditation, but like you mentioned, time is often a roadblock, or at least I’m allowing it to be. I am pretty observant of my own thought and I have realized I have tremendous power to reprogram this phenomenon we call a brain. You bring the point home by saying that we have to associate good thoughts with whatever we fear. This banishes the fear and helps us associate good feelings with whatever we are struggling with. Hi Jose Cruz. Indeed, meditation is a royal way to the inner world. Through better knowing yourself you can reprogram your mind by learning how to avoid inner conflicts. I have a real interest in meditation and inner peace as I suffer from anxiety and depression. Just want to find a way to feel better and not so stressed all of the time. I like the fact that the courses are short, only 10-20min at a time, I always feel like there is just never enough time. I would love to be a top performer without the added stress that would be such a great feeling. Thank you for such an informative article about meditation. Hi Andy. I am sorry to hear that you suffer from anxiety and depression. As I wrote, depending on how serious your problems are, you should not avoid going to a specialist. However, meditation helps a lot in our so stressful life, especially if you want to be a top performer. I love meditating. Stress and anxiety can really get to me and meditation is a great solution. Guided meditation sounds awesome and even better than just the way I’ve been meditating. I would love to look into courses online! Meditation does wonders for me and I’m now anxious to proceed with guided meditation. This is going to help me with building my confidence, self-esteem, and attitudes in dealing with the negative aspects of life. Do they charge for this online or does Youtube offer anything? Hi Rob. These are online programs, so, yes, they do charge.